We’ve taken the trusty old spitbraai and given it a new home! 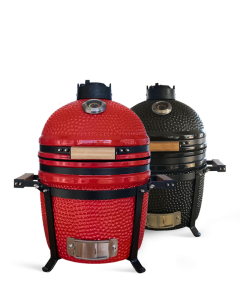 Keep on enjoying all the benefits of your Kamado JAN, only this time, throw in a rotisserie! The wedge shaped ring fits snugly between the base and lid. Cool grip handle for easy skewering. 304 Food grade stainless steel. Keep your food locked in position for the perfectly uniform result. 304 Food grade stainless steel. Runs on an electric motor for extended cooking times. The motor also has an optional battery operated function. 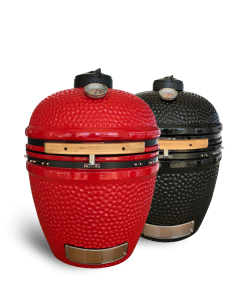 The Kamado JAN rotisserie is the ultimate plug & play spitbraai solution. No alterations needed. 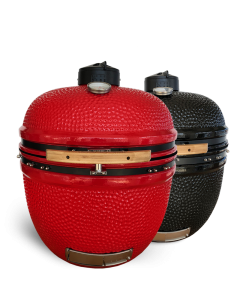 The tapered wedge steel ring acts as a rigid base for the stainless steel skewer and allows for an air tight seal when the lid is closed. This enables you to regulate temperature with accuracy.